Looping maneouvre with Shaun Harris and onboard dual-cams for two-channel video installation from Alex Monteith on Vimeo. Two channel video installation playing simultaneous front and rear recordings shot at Taupo Motorsport Park in February 2008. New Zealand motorcycle racing legend and two times Isle of ManTT winner Shaun Harris rides the GSXR motorcycle at speeds of over 270kph whilst making recordings for the installation. The action / ride was the fourth session at a track-day the Shaun participated in post crash at the Isle of Man in 2007. 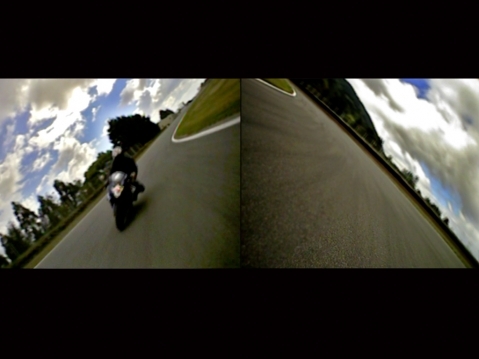 Taupo Motorsport Park is one of New Zealand most technically demanding race tracks, with extremely tight corners which result in steeply sloping horizon lines in the video recordings as Shaun banks the motorcycle into each turn. Need for Speed, St Paul St Gallery, Alex Monteith solo show, July 2008 Auckland, New Zealand.